Cycling, also called bicycling or biking, is the use of bicycles for transport, recreation, or for sport. Persons engaged in cycling are biking or bicyclists. Apart from ordinary two-wheeled bicycles, cycling also includes riding a unicycle, tricycle, quadracycle, and other similar human-powered vehicles (HPVs). Bicycles were introduced in the 19th century and now number about one billion worldwide. They are the principal means of transportation in many regions. Bicycling is a highly efficient mode of transportation and optimal for short to moderate distances. 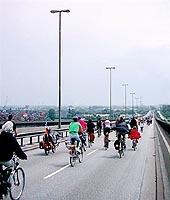 Compared to motor vehicles, bicycles have numerous benefits including the provision of exercise, generating renewable energy and thus no air pollution, reducing traffic congestion, minimizing noise pollution (nearly silent operation), easier and less costly parking, much lower likelihood of causing a fatality, high maneuverability, ability to travel on roads or special paths, and lower user cost as well as societal costs (negligible damage to roads, and less pavement required). Criticisms and downsides to cycling commonly include: reduced protection in crashes (including those with motor vehicles), longer travel time (except in densely populated areas), no inherent protection from poor weather, difficulty in transporting passengers, and the physical demands of operation.